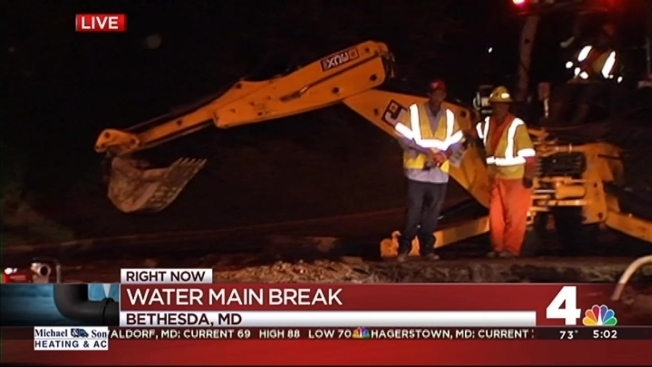 Delayed repairs to a broken water main in Bethesda, Maryland, mean a busy road will remain closed overnight and possibly through the Wednesday evening commute. WSSC said Bradley Boulevard (MD-191), which was closed Monday night at Huntington Parkway for emergency roadwork, will remain closed through the night and possibly will not be open for the Wednesday evening rush. A 16-inch, 61-year-old water main broke in the 5900 block of Bradley Boulevard. Other utilities in the area of the break also caused delays. Washington Gas and Pepco have lines in the area and are monitoring the repairs. Water was off for 25 customers but should be restored by 11:30 p.m. Tuesday.